Was IBEX 2010 the turning point? 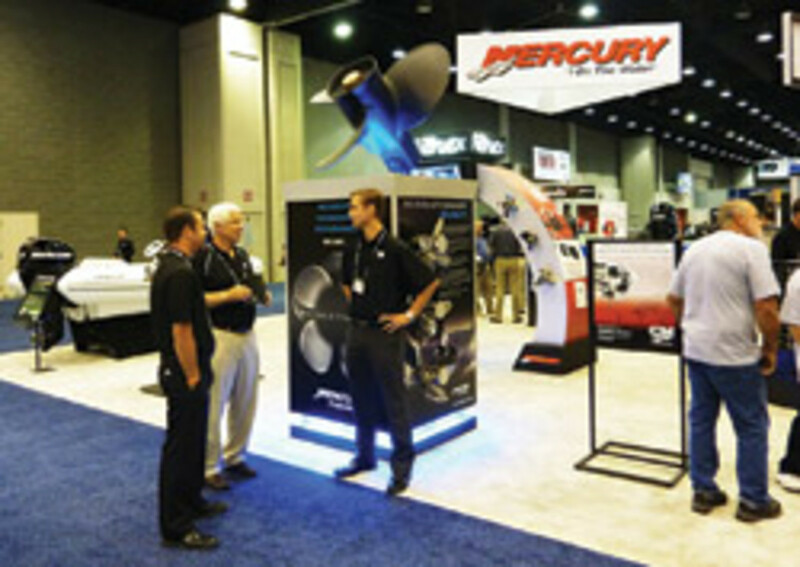 It&apos;s been a tough couple of years for the International BoatBuilders&apos; Exhibition & Conference, but exhibitors and organizers say 2010 may have marked a turning point for the event - and the industry as a whole. "The past two years reminded me of a wake. Today I feel like I just came back from a christening" is how Greg Scholand, business manager of New York-based Lighthouse Marine Distributors, described the three-day show after its Sept. 30 closing. "The hall was great, people very friendly and helpful, and the downtown was the perfect place for &apos;after meetings&apos;. The best thing, however, was the mood of everyone." Thoughts such as Scholand&apos;s were heard throughout the exhibit hall at Louisville&apos;s Kentucky Exposition Center, which hosted the show for the first time this year, marking IBEX&apos;s first foray out of South Florida. Exhibitors were doing business in their booths, the aisles were no longer empty, and organizers say they had more on-site registrations than they were accustomed to. "That truly endorses or supports our contention that it&apos;s easy to drive to Louisville," says show co-director Carl Cramer, publisher of Professional BoatBuilder magazine, which organizes the event with the National Marine Manufacturers Association. Although he admits there was a feeling of uncertainty before the show opened, the result was "nothing short of stunning." IBEX 2010 saw a 13 percent increase in attendance; 5,161 people were there, compared with 4,567 last year. Attendance at IBEX had been dropping for the past few years, and 2010 marks the highest attendance in at least three years. The latest event is a far cry from 2008, when the stock market fell more than 18 percent during the week IBEX was being held. And last year wasn&apos;t much better, as 2009 was a difficult year - to put it mildly - for the boating industry. "I think 2010 is going to mark the bottom for the boating industry," says NMMA president Thom Dammrich. "Clearly, for the boat manufacturers, 2009 was the bottom. We only produced about 80,000 boats in the whole country in 2009. We&apos;re going to produce 50, 60, 70 percent more than that in 2010, and I think we&apos;ll see that continue to grow in 2011. "Retail is still declining, but it&apos;s declining at a slower rate," he adds. "It&apos;s getting ready to turn, and I think, as we get into 2011, we&apos;re going to see year-over-year growth at retail, too." Dammrich predicts a tough fall for retailers - and for builders as well - as production slows. "I think, for a while, this demand-pull, as opposed to production-push model, is going to predominate, and boat manufacturers are going to have to learn how to really sprint in their manufacturing capabilities during the big selling season and take some time off in the offseason," he says. However, people are going to continue to want the latest innovations for their boats, and that&apos;s what IBEX is all about. This year, for example, new evaporative emissions systems were "one of the hottest things," at IBEX as boatbuilders prepare for regulations that are about to take effect, Dammrich says. "If you&apos;re a boatbuilder and not here, you&apos;re behind the curve already," he says, "[Other builders&apos; boats] are going to be more exciting than yours next year. This was not the year to miss IBEX." Paxson St. Clair, CEO of Cobalt Boats, was one of the many builders who was happy he made the trip to Louisville. "I was pleasantly surprised by the number of people in the aisles," he says. "We had good crowds, great attitudes, [and] I would say it was a night-and-day difference over last year." During his address at the annual Industry Breakfast Sept. 28, the first day of the show, Dammrich said that even in a sluggish economy, boating remains a $31 billion business. Although people are buying more used boats than new ones - 82 percent used compared with 18 percent new in 2009 - that balance should start drifting back to a more traditional 72-28 split in the coming years. New-boat sales are down 55 percent, but total boat sales are down only 16 percent from their peak in 2006, Dammrich told the gathering. "Overall, this industry is healthy and still alive," he says. "We are resilient, the American consumer is resilient. We will bounce back again. The momentum, I believe, has shifted in our direction." Nearly 550 exhibitors took part, and 70 of them were first-time exhibitors. Chad Williams, vice president of sales and marketing for PierVantage, was one of those exhibiting for the first time, and he says IBEX was a success. Vantage product, which is our boatyard management solution, as well as our customer experience portal, which is our marine supply business-to-business e-commerce portal. So we&apos;ve spoken with a number of clients and potential clients, and it&apos;s been great. ... We have demonstrations going on, and we&apos;ve had pretty constant traffic. We&apos;ve been pretty busy the whole time." Williams says his company was not sure what to expect as it prepared for IBEX. "We were trying to manage expectations, and I&apos;d say it&apos;s exceeded where we thought we would be," he says. Veterans of the show also were generally pleased. "This year&apos;s IBEX in Louisville has been very positive," says Frank Marciano, president of Dometic Marine, which won an Innovation Award for its In-Duct Breathe Easy air purifier. Turnout, he says, was good, and the company had some good discussions, although he had hoped to see more boatbuilders than he did. Marciano says business in the last year was slightly up for his company. He&apos;s projecting business will be flat or possibly up slightly next year. "What we saw [this year] was an industry that was slightly up as a whole, but with the bigger boats struggling and the smaller boats&apos; production increasing," he says. Although builders are beginning to put the brakes on production going into the fourth quarter, Marciano says he&apos;s hopeful that, come January, they will ramp up again. 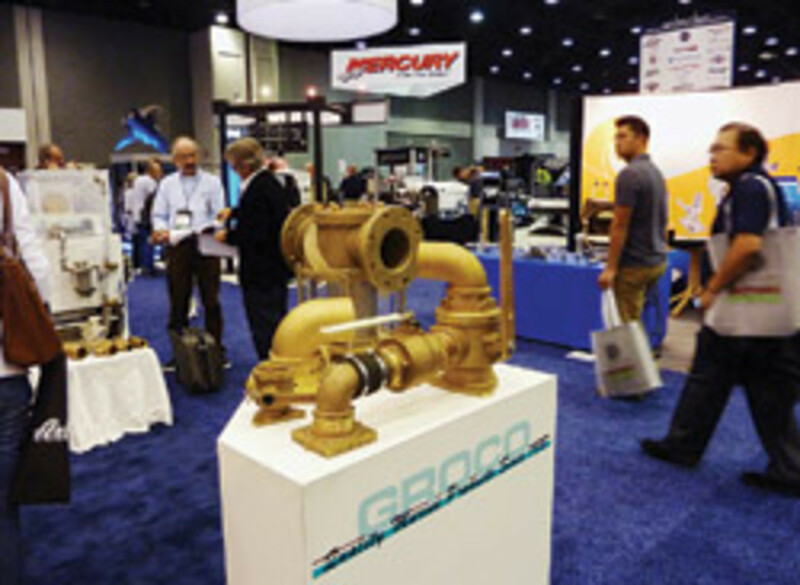 "The show has been excellent," says Dave Lerbs, manager, sales and marketing, for Indel Webasto Marine USA. "We&apos;ve had a lot of traffic from major boatbuilders. We&apos;ve seen some distributors as well. It is a down economy, and a lot of people are looking to economize on their travel, so it was good to see as many people as we saw at the show." Lerbs says his company, which makes isotherm marine refrigerators and isotherm stainless-steel water heaters, has seen business grow this year, although it&apos;s starting to level off, especially on the OEM side. "We were a little concerned coming down because of the change of venue from Florida, but it&apos;s actually had a lot of traffic," Bob Grenke, product manager of Molex Inc., said on the show floor in the final hours of the event. "We&apos;ve had some really good leads, some really interested people, some existing customers, which is nice, too. We&apos;ve found it to be a success. "Any time you have a change, there&apos;s always a concern," he said, pointing out that Florida is one of the boating capitals of the world and that Louisville is in the heart of the Midwest. "But I think people found it was very economical to come here ... and we found it very accommodating. Costs have been less, and I think there&apos;s more people here this year. It seems like there&apos;s more people coming through." Grenke says business has been "consistent" at Molex this year, and things have been "trending up" for the last six to 10 months, which is why he thinks IBEX was well-attended this year. Molex, a connector manufacturer, was showcasing its "service-grade brand" tools this year. Bruce Essig, national sales manager for program distribution groups for EnerSys&apos; Odyssey Batteries, says his company had a good year and that the "industry certainly has demonstrated it&apos;s coming back," which is why he thinks the mood was so positive at IBEX. "Those who come by the booth are those you really want to talk to, and you do have really good conversations," he said on the final day. Essig also praised the move to Louisville, saying that many of the highest-producing boatbuilders are in the Midwest, and it made sense to move the show closer to that population. "You get closer to the bulk of not only the boatbuilders that produce more units than South Florida builders but also more of the vendors that serve the industry," he says. 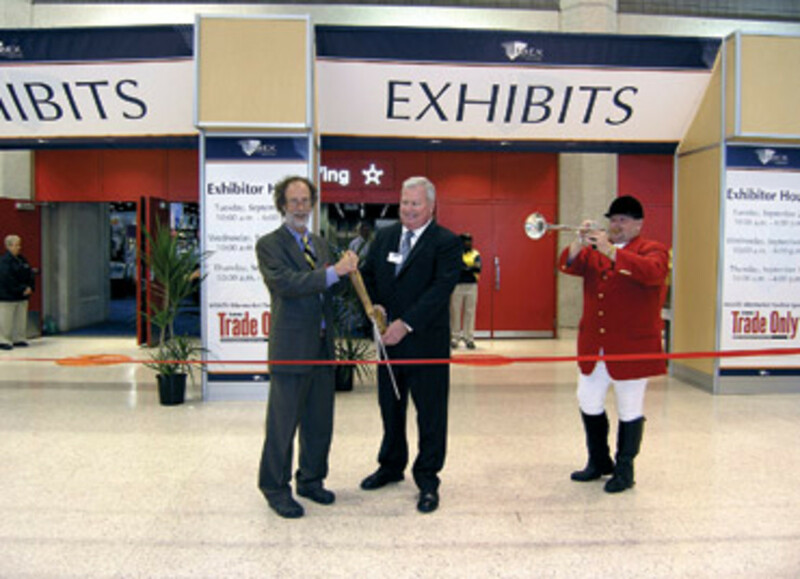 New to IBEX in 2010 was the MAATS Aftermarket Pavilion, sponsored by Soundings Trade Only. The pavilion, with 72 exhibitors, was added after the demise of MAATS as a standalone show. David Suaya of Fuel Medics, says the pavilion was "excellent." "The show has been pretty good," he said on the floor. "We&apos;re getting a lot of good contacts." And although the Miami-based Suaya would have preferred to stay in South Beach, he says it was less expensive to do business at the new Louisville location. 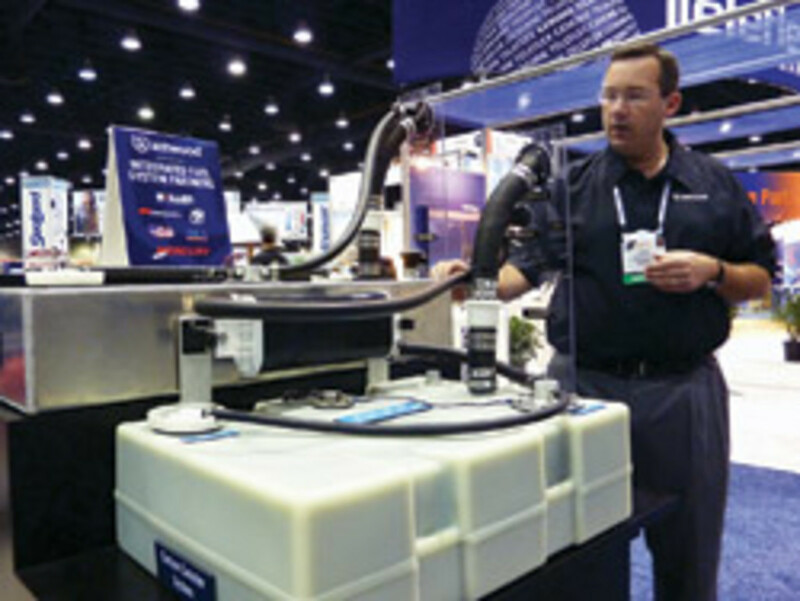 "It&apos;s been good - a lot busier than I thought it was going to be," says Gabriele Allan Isham, sales manager for Orlando, Fla.-based NorCross Marine Products, which makes products under the HawkEye, NorChill and iClear brand names. Isham says he thought the move to Louisville was a "positive thing for attendance. It&apos;s much easier for everybody to get here." He says it was a good idea to combine the shows and says he&apos;d like to see that expand in the future with more participation from retailers and distributors. Being a part of the MAATS pavilion has "turned out really well," he says, adding he liked that it was an open area and not closed off and secluded from the rest of the show. "[Attendees] may walk into a product they might not normally see," he says. Dometic&apos;s Marciano says it was "beneficial to have MAATS integrated this year, as we got a chance to address OEM and aftermarket business in the same venue." Dammrich says he expects the MAATS pavilion to grow, adding that the aftermarket has been at IBEX for years but previously did not have such a prominent display. And as for those who say the show comes too late in the year for the aftermarket segment, Cramer says, "Buyers make buying decisions all year long," so the time of year shouldn&apos;t have a huge impact. The inclusion of MAATS helps broaden the show to make it more inclusive for a larger segment of the industry. The boating industry has gotten smaller, so it&apos;s economical to have fewer but larger shows, Dammrich says. "I think there&apos;s going to be growing pressure to consolidate, and IBEX is the logical place," he says. Next year&apos;s IBEX takes place Oct. 17-19 in Louisville.